So the snows return, if not to Nottingham at this time. Maybe the city will perform it’s regular trick of avoiding the worst that winter can thr ow at the UK. Other people have not been as fortunate though, in particular Northern Ireland which appears to be recording record falls. Snow is fine when we can stay at home and enjoy it’s mystery and beauty, the other side of the coin can be much grimmer however, especially for those caught in difficult situations on the roads. I can empathise because I’ve had a couple of reasonably terrifying situations in Canada in the blizzards to deal with. One notable one was on the ‘Connector’ road in the British Columbia interior in an almost complete white-out when an oil tanker jack-knifed off the road into a ditch in front of us. The road was being closing behind us as we drove scarily through to our Vancouver destination. Others were less fortunate as they were directed off the road and into the likes of local town sports halls to bed down for the night. To make matters even more difficult avalanches were predicted too. It’s difficult to describe how hypnotic and transfixing hard driving snow at your windscreen for long periods can be if one has never experienced it. It’s like driving into a frozen hell that one may not emerge from. 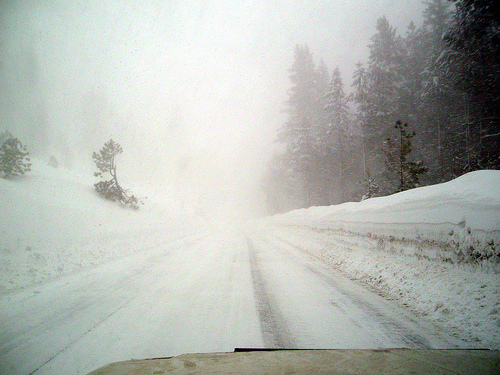 Here’s a tale of ingenuity and winter driving that might appeal. Here in Nottingham a few years back we had a particularly heavy dump of snow one Friday evening. My nephew left work at 9pm that evening faced with atrocious conditions and a three-mile drive home in the impossible Toyota MR2 Mk1. I should state immediately that there has rarely ever been a worse handling car in the snow than the early MR2’s, with it’s rear-wheel drive and front-end lightness. (The shape of the front valance almost acted like a mini snowplough dumping piles of the white stuff onto the bonnet too.) His solution (after skidding around in the car park for ten minutes)? He turned the car round and reversed all three miles home – viola – a front-wheel drive car!